Kovalam has been a preferred beach destination of Kerala for tourists from all over the world. Located 16 Km away from Thiruvananthapuram city, Kovalam comprises of three crescent-shaped sandy beaches known as the Light House Beach, Hawah Beach and Samudra Beach. These beaches are extremely popular due to shallow waters and low tidal waves. It offers a plethora of choices for leisure ranging from sunbathing, swimming, water sports, cultural programmes and ayurvedic rejuvenation to simple relaxation. The presence of such attraction factors have resulted in significant tourist inflow to the destination over the years. 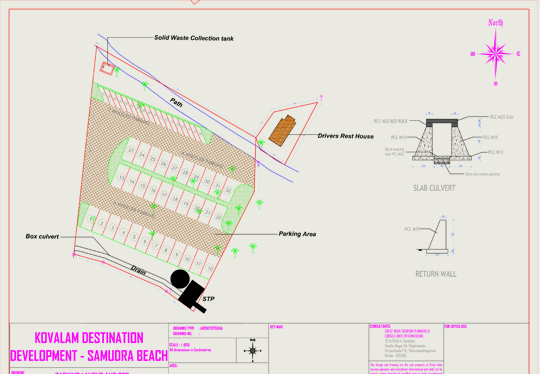 It is proposed to upgrade the existing infrastructure and readjust the landscape at Samudra Hotel, Kovalam to enhance parking, treat and drain waste water flowing through its premises, restore the waste water accumulation area at the outer reach of the beach, improve swimming pool safety, provide outdoor restrooms and restore walkway and fencing along the boundary of the property. 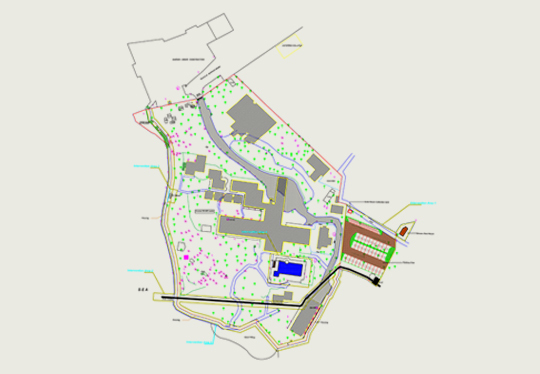 The intervention areas identified have been numbered so as to depict the infrastructural improvisations that will be incorporated.